A screenshot of LAEO's YouTube video of the dramatic rescue. The lions were living in deplorable conditions, in tiny, dirty cages made of concrete and steel, with no doors or windows. 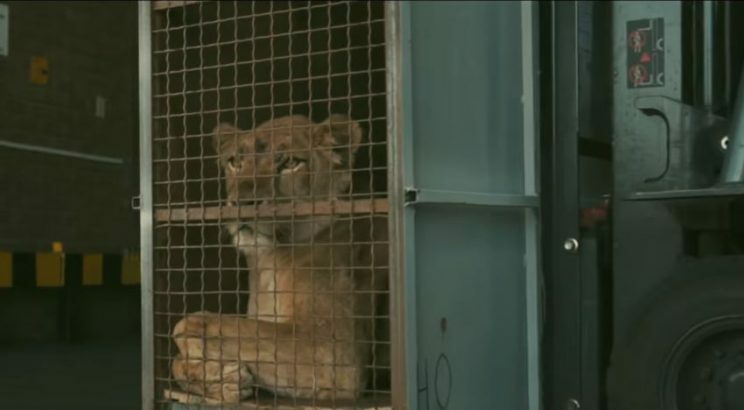 Three lionesses and one male cub were saved after a harrowing rescue effort by Turkish Airlines’ cargo company, Turkish Cargo. Luca, Charlie, Kai, and Nathan were accompanied by veterinarians and Turkish Cargo personnel that were certified in transporting live animals in a 9,000km flight from Ukraine to South Africa, with a stopover in Istanbul. The rescue is thanks to Lawrence Anthony World Organisation (LAEO) Ukraine director Lionel de Lange. LAEO is an international non-profit organisation dedicated to saving abused wild animals and relocating them to better facilities. Animals are confiscated from zoos, circuses, and private homes. “I knew that I couldn’t leave these lions behind. They were living in 35 square metres of concrete and steel. Their cage was welded shut so you couldn’t open or close or get in to clean them. So they were living in their own faeces and urine and leftover food bones,” he said. The lions get to call the Kragga Kamma Game Park in Port Elizabeth their new home, a natural habitat with 14,000 square metres of green coastal forest and meadows.